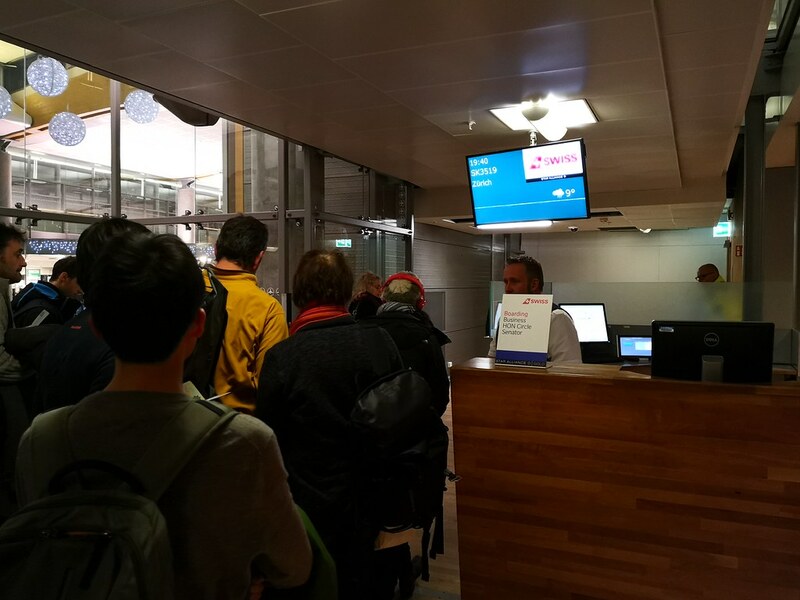 When I reached the gate, boarding was just about to commence and there was a long line of passengers waiting to board. I guess one of the perks of being in Business Class here is the priority as I could jump ahead in line. This was particularly useful since I wanted to spend some time on the jetbridge to take a photo of the Bombardier CSeries. This was to be my first time flying on this particular plane and that certainly got me excited a bit. 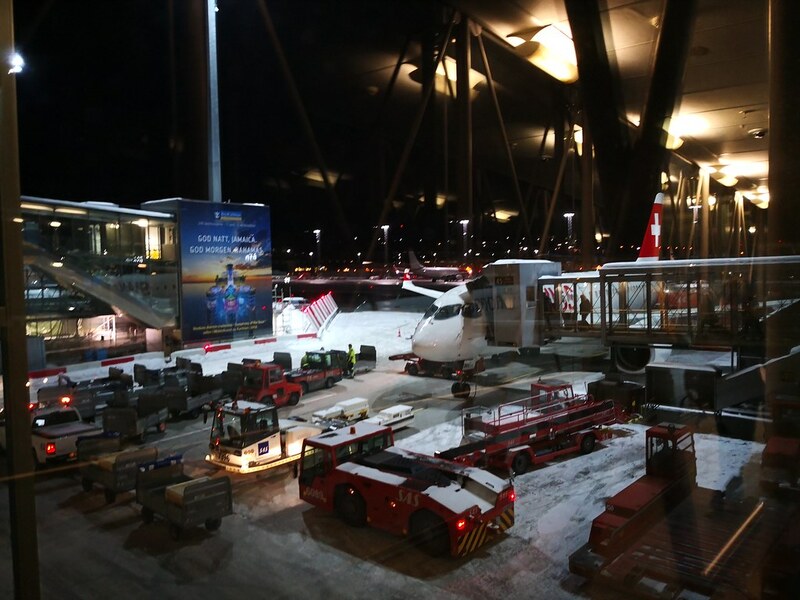 After all, there is not much else to be excited about for an intra-Europe flight, especially at the end of your skiing holiday. Some things you note while boarding are the wings of the CSeries looks just like the rest of the airplanes and definitely less distinctive than the 737 Max series. However the nose of the new plane looks sleek outside and it was even better inside. 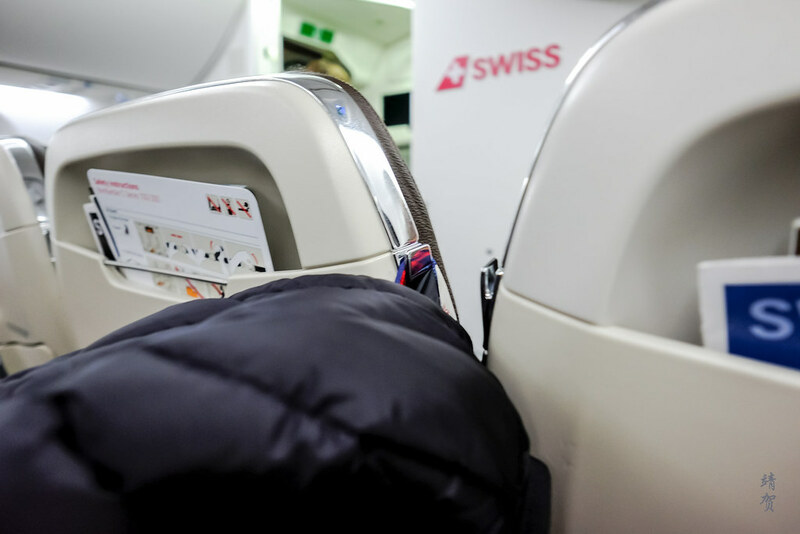 Swiss has chosen to go with the thin seats to maximize legroom but it does have neat chrome trims around a brown leather upholstered seat. Seats are in a 2-3 abreast configuration, and it does feel more spacious with the clean white interior. These chrome trimmings double up as a jacket hook at each end which adds to some functionality as well. 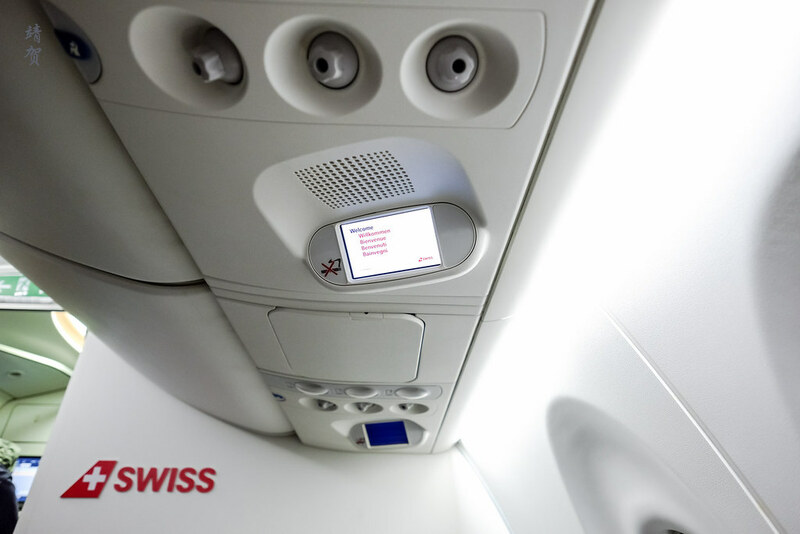 On the overhead, there are individual air vents along with a small monitor screen that provides flight information. And above that, the overhead luggage hold is spacious, definitely an upgrade over the usual 737s and A320s. 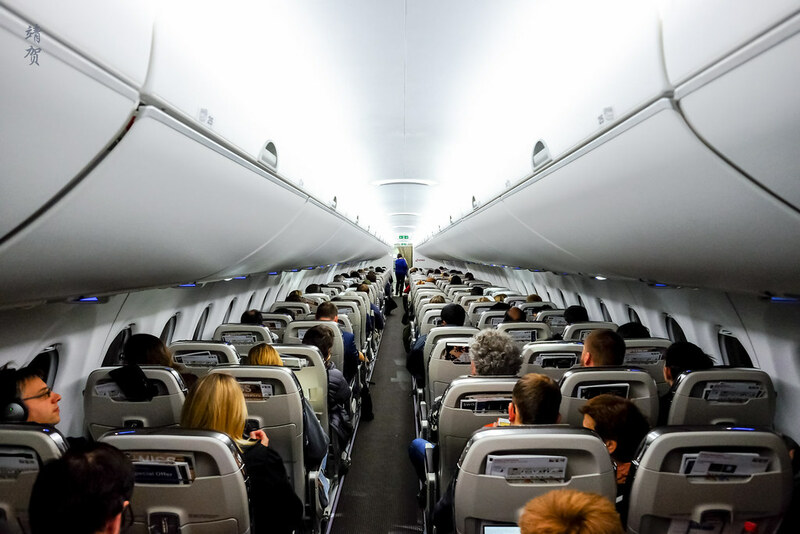 However, there was no cabin separation between Business and Economy on the smaller capacity plane. 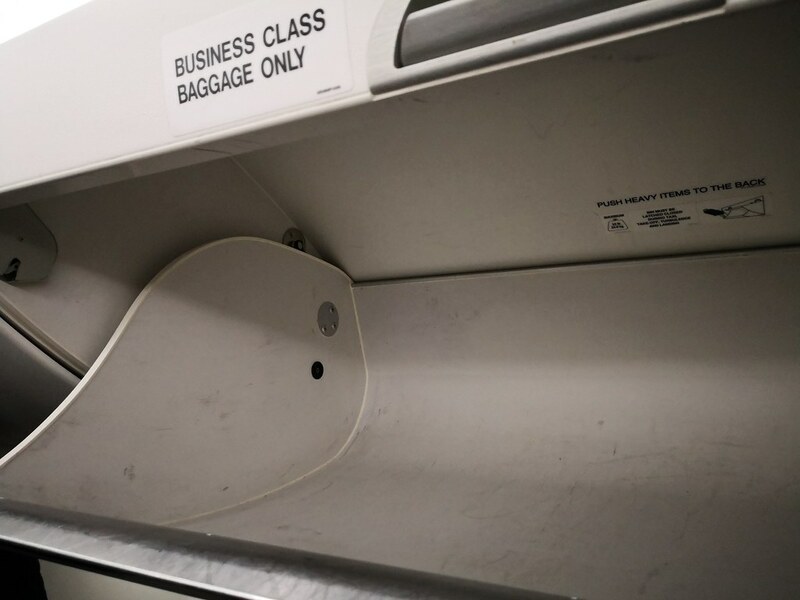 No curtains or whatsoever, which means the only thing differentiating the Business Class seats and the Economy ones are the signs for ‘Business Class Baggage Only’ on the luggage compartment. 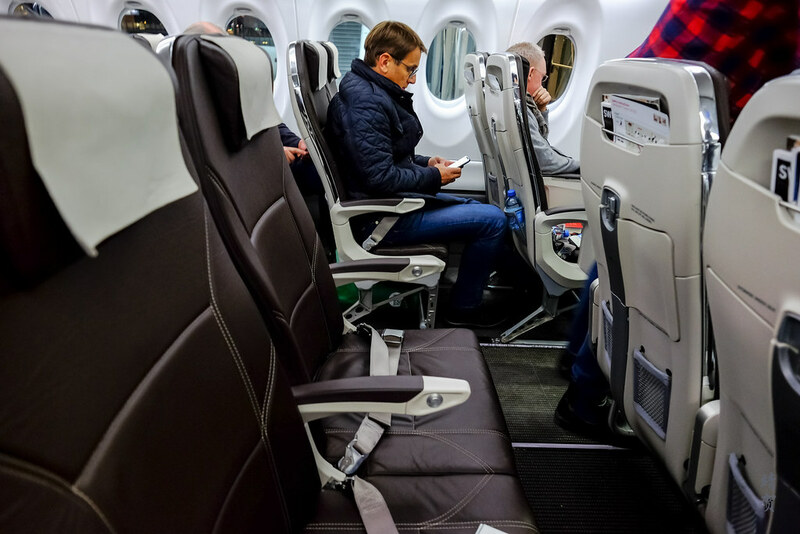 Such is the state of travelling within Europe in Business Class, which means the premium for these tickets are usually not that much higher either. 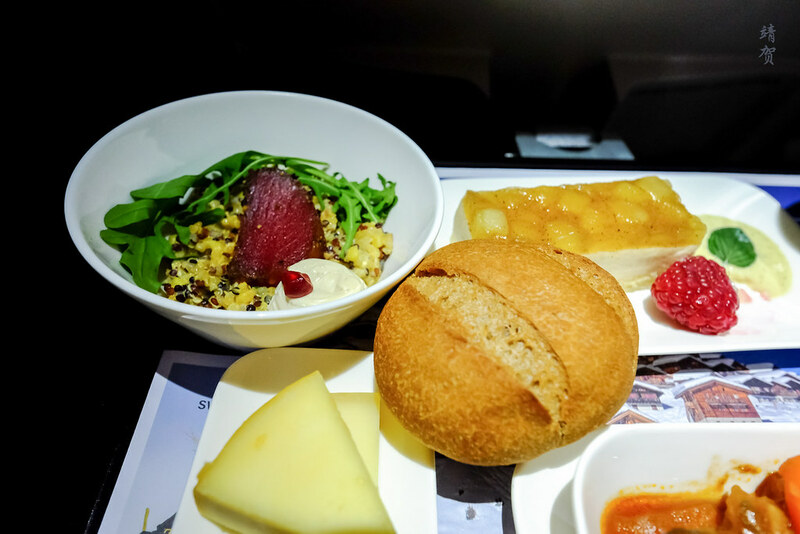 Since this was part of a connecting flight to Singapore, I take it as a chance to be seated upfront with more conveniences and slightly better catering. 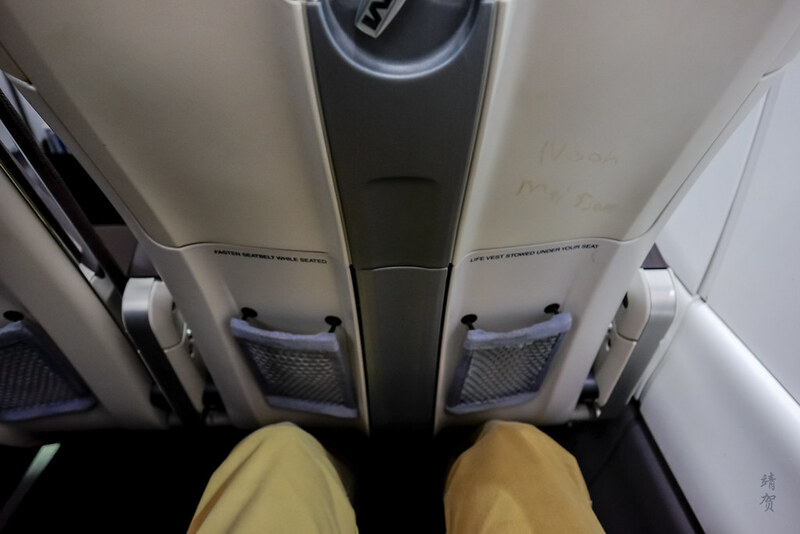 Anyway back to the seats and I had chosen the second row seat on this flight as I wanted to get a feel of what most passengers would experience and I am not a big fan of bulkhead seats. 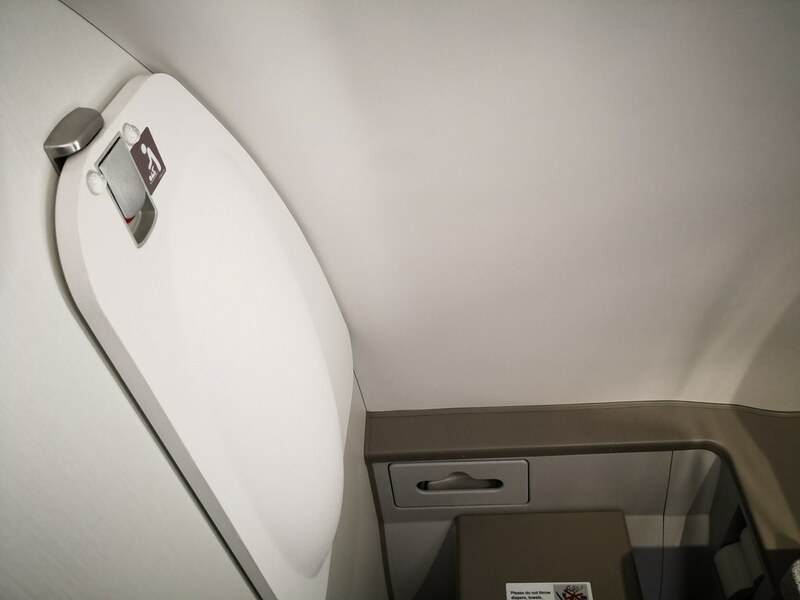 Here it seems there was more space on the bulkhead that I might just go for row 1 when flying on the Bombardier CSeries. 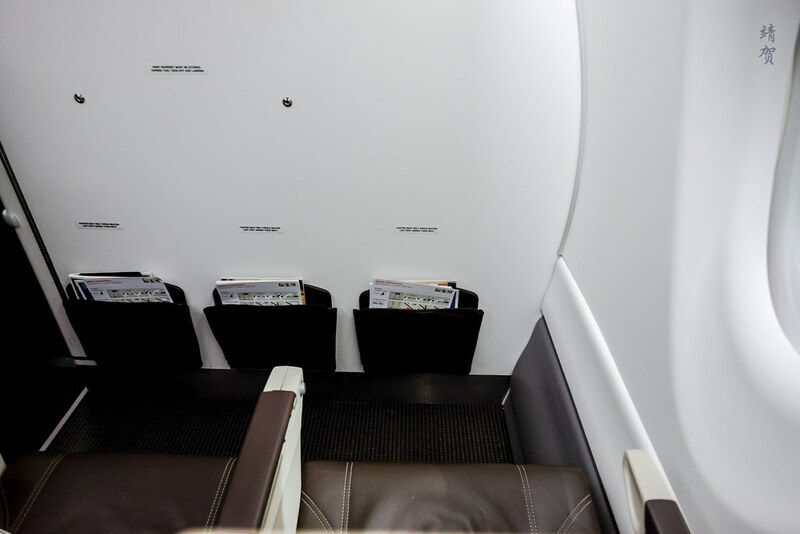 However the normal seats on row 2 offers decent legroom as well which is a step up from the Fokker 100s or BAE Avro jets that these planes are meant to replace. 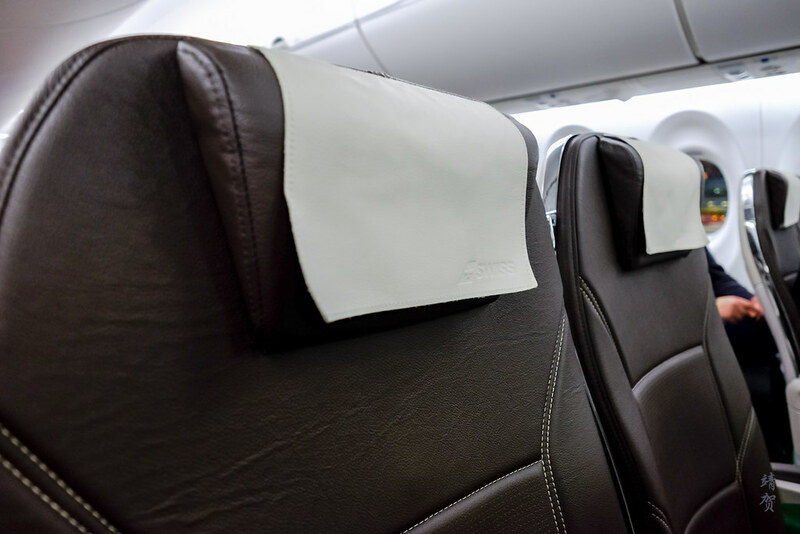 In addition, there was 2 sleeves at the bottom part of the seatback that could be used to store water bottles or mobile phones since they are extendable. 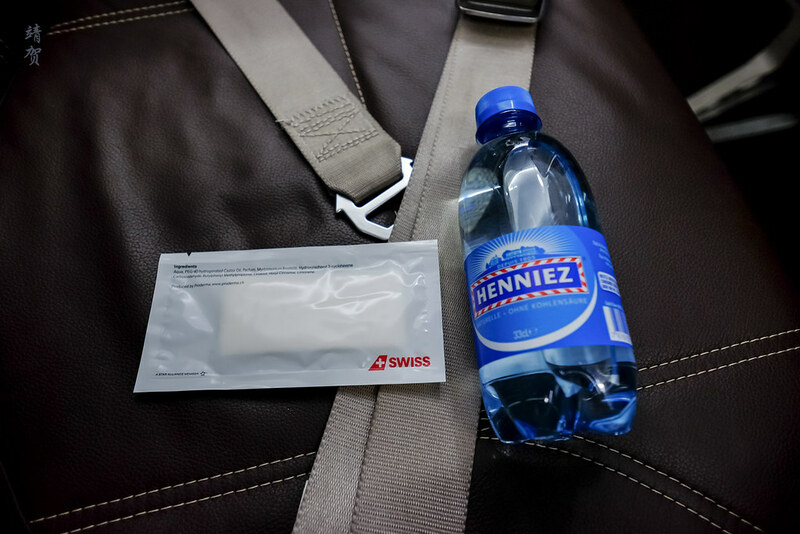 Bottled water and wet wipes are distributed after boarding is complete and it was convenient to use the blocked seat beside me to place them. I had chosen the window seat but managed to get the whole row of 3 seats empty for myself on what seems to be a relatively full flight so it was lucky for me! Captain welcomed us on board once all passengers have boarded and announced our flight is ready for pullback, which is somewhat reassuring since I just have 45 minutes to connect to my International flight in Zurich. 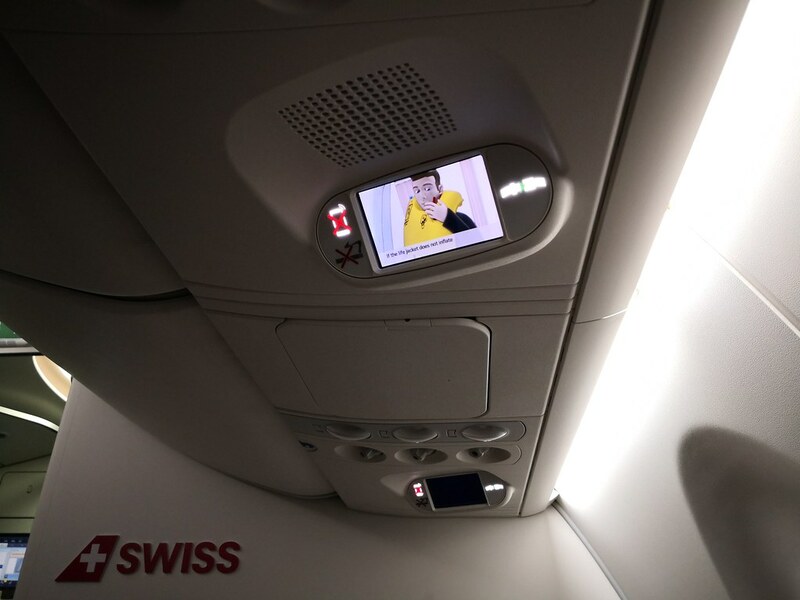 Flight time of approximately 2 hours and 5 minutes was announced by the purser while the safety video screened on the small overhead monitors which also shows the flight map. 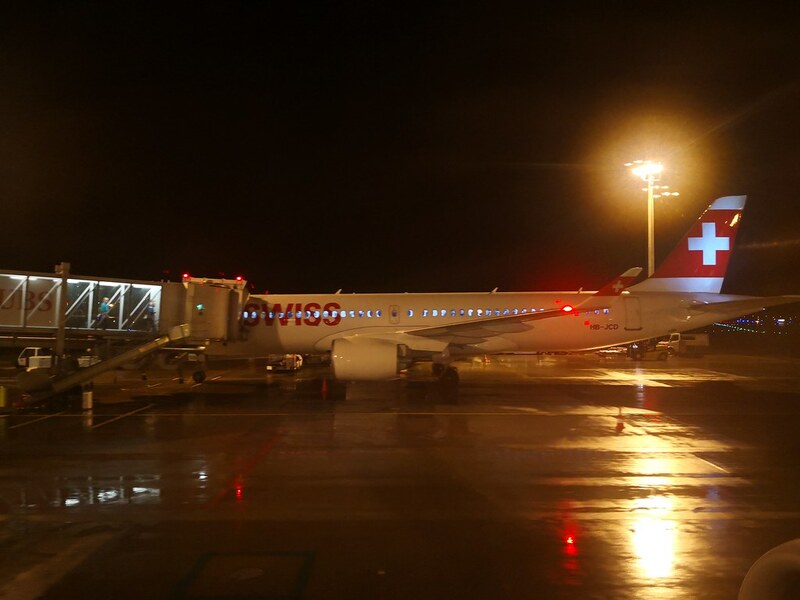 After pulling back from the gate at 19:45, the plane proceeded to taxi for quite some time. 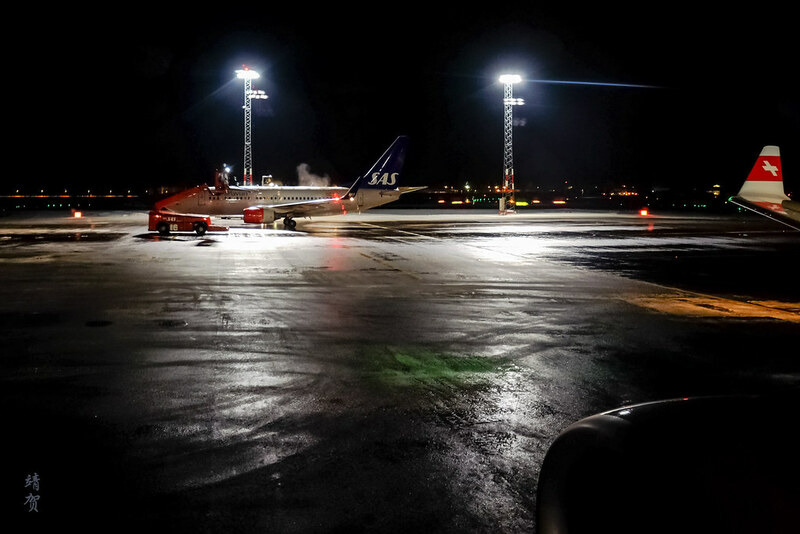 It turns out there was a need to de-ice the plane and that delayed our departure by a bit. But it was still a unique experience as this was only my second de-icing experience. Quite surprising really since I travel to so many cold destinations for skiing! Fortunately, at the end of the de-icing, there was no other obstacles which allowed a smooth take off from the runway. 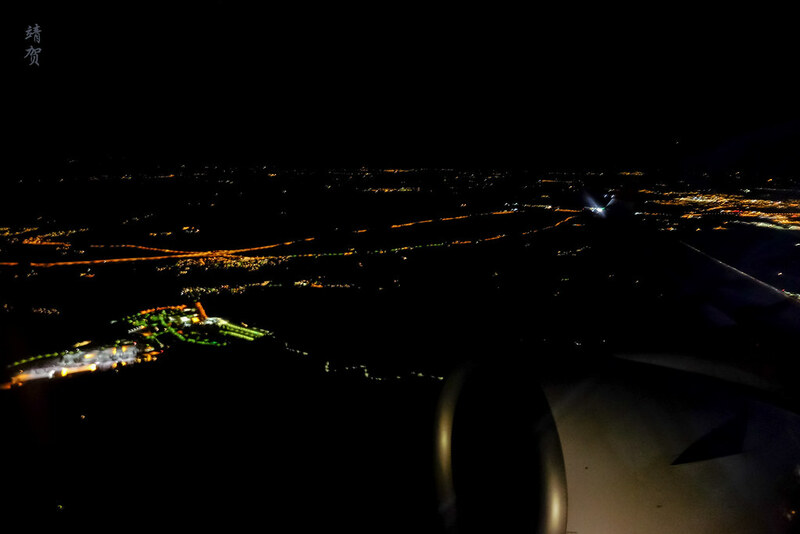 Flying on the C Series for the first time, it was a very refined take-off with less rumble, and the large windows makes it easier to get a nice view. After take-off, the only thing left to do was wait for the cabin service. 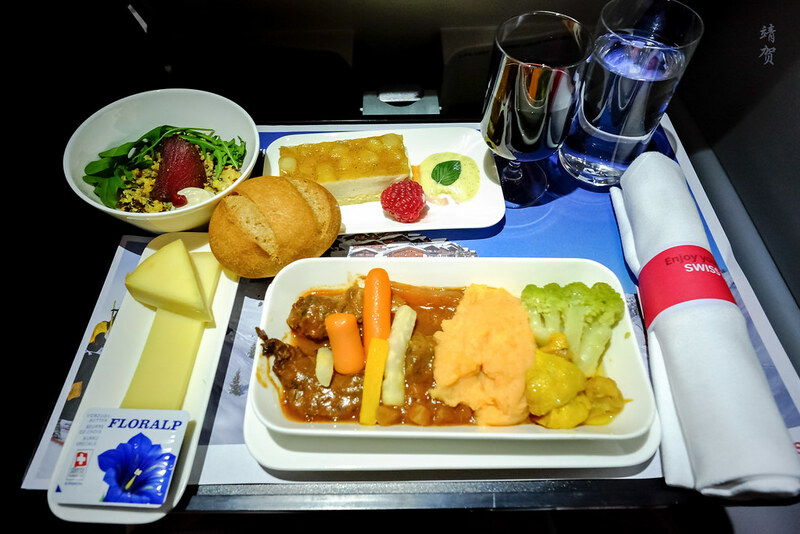 On this flight, the food choices was between beef goulash or raclette with vegetables. Bread was offered from the basket with 2 different kinds available. Red wine was also proactively offered and I asked for a glass of water in addition to the wine. On the meal platter, there was a small bowl of quinoa with a slice of tuna, a plate with cheese and butter and another plate to hold the dessert which was an apple cream tart. Crew checked on me in between meals and asked if I would like anything else. I asked for coffee which was provided with all the condiments and the Swiss milk chocolate. 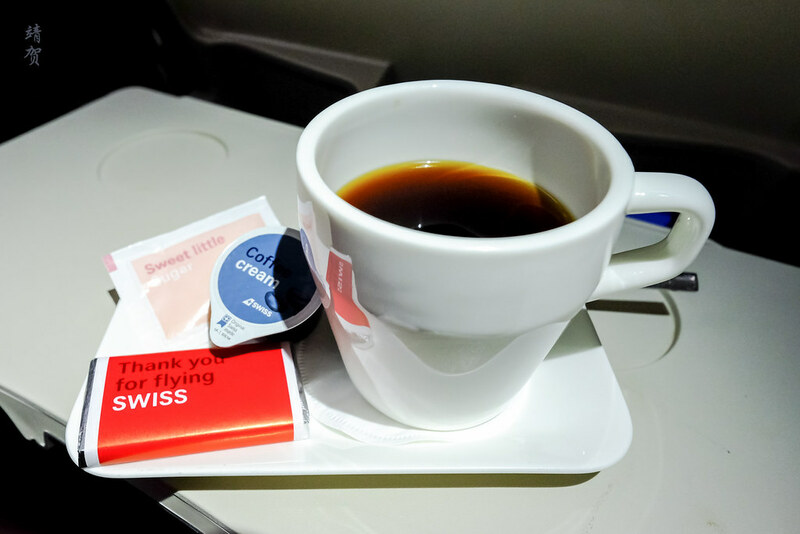 Trust me, the coffee onboard Swiss is one of the best and the milk chocolates have won the airline plenty of fans! Duty free sales cart was brought out to the cabin after meal service. 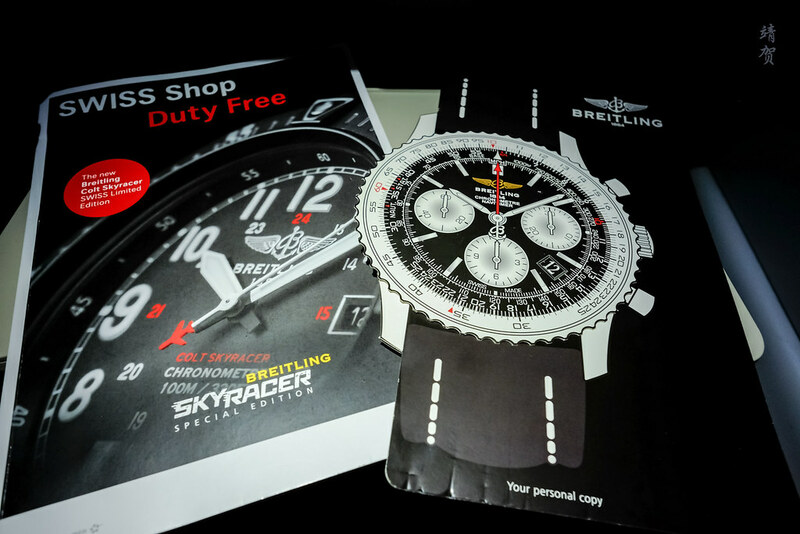 I used the time to peruse some of the selection on offer and Swiss seems to be promoting Breitling watches with a special insert showcasing on how to use the chronograph markings. Not interested in purchasing anything, I made my way to use the lavatory. As a new plane, it was nice to be in a new inflight lavatory. The design was smart and again a step above the usual 737s and A320s. 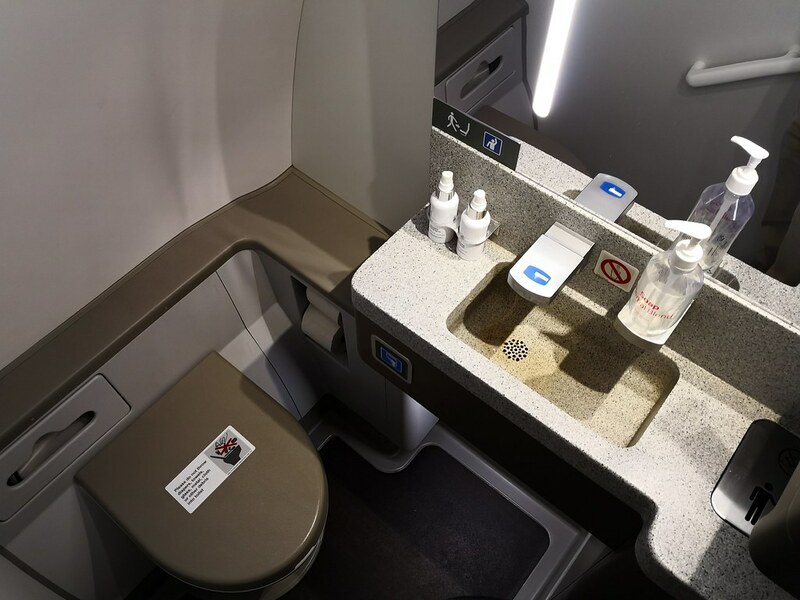 My guess is the use of the colours and the shape of the countertop made the space appear larger even if it took up the same footprint as an A320 or 737 lavatory. There was also a fold out table in the lavatory for easy changing of diapers if needed. Milk chocolates are distributed around the cabin about 50 minutes before scheduled landing and I got another of these chocolates. While the service was alright, the meal trays and coffee cups was slow to be cleared by the crew during this flight. I figured it might be due to the late flight time and the relatively full flight. The rest of my flight was just spent relaxing on the flight trying to calm myself down due to the short connecting time to my next Swiss flight. 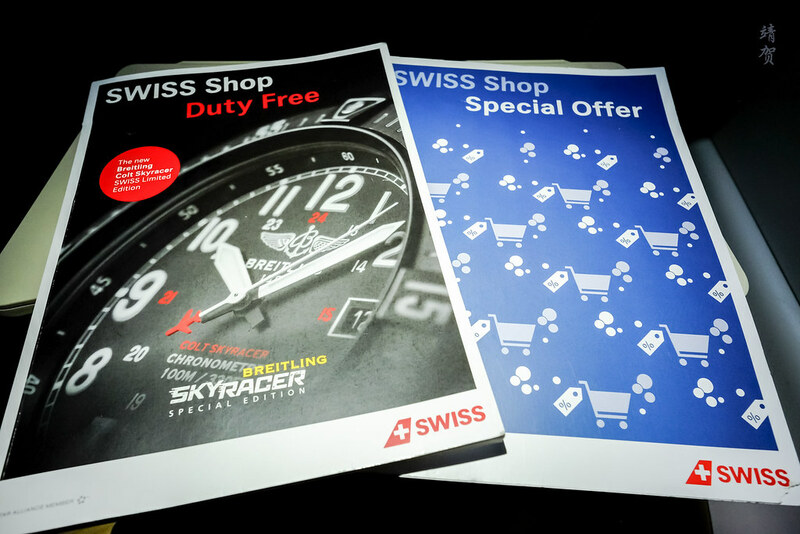 I spent the time reading the fantastic Swiss Magazine. 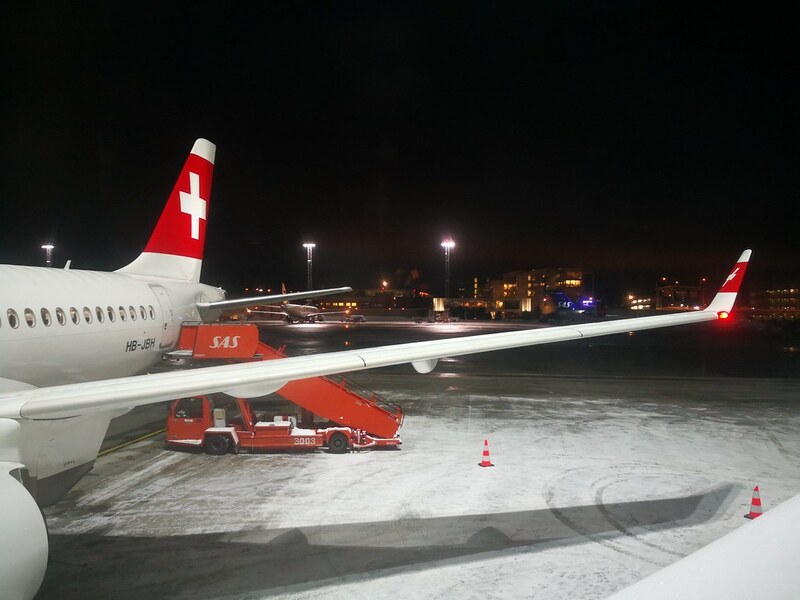 What did little to my mood was the slight turbulence during our descent into Zurich and that meant we were slightly delayed with an estimated arrival time of 22:15. This meant my connection time of 45 minutes is now down to just 30 minutes. By then I was more or less resigned to spending a night in Zurich. 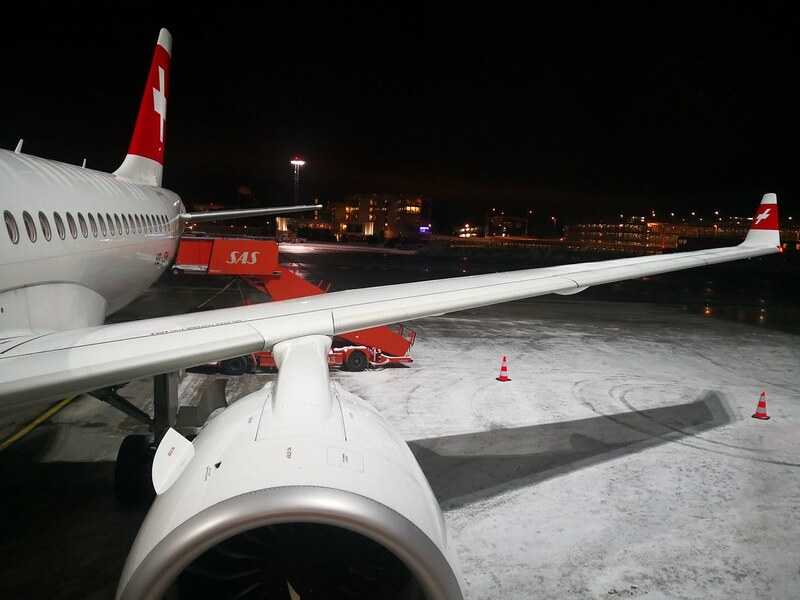 Eventually we landed in Zurich slightly behind schedule and parking next to the larger Bombardier CS300. 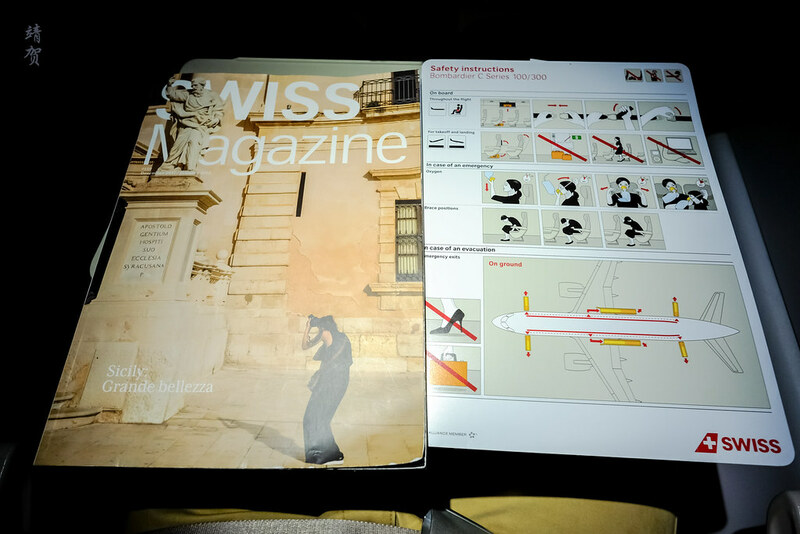 This novel flight certainly showed me that Bombardier has built an amazing plane in the CSeries. 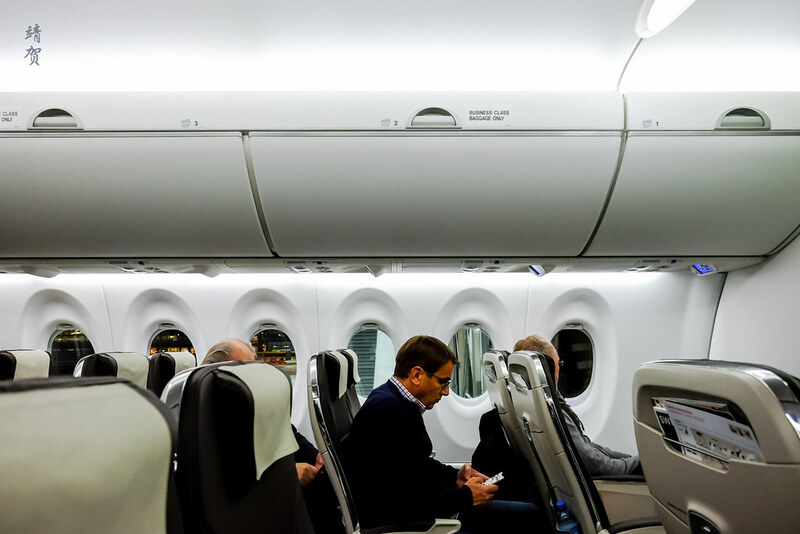 The comfortable cabin, the smart looking chairs and the larger windows with nicer overhead controls certainly showed the designers of the plane paid attention to details that would make passengers more comfortable. The plane was also well built with both take-off and landing being very comfortable and seemingly more stable. With that being said, I hope to see more airlines utilizing the CSeries as I find they are probably the best single aisle jet to fly on today. 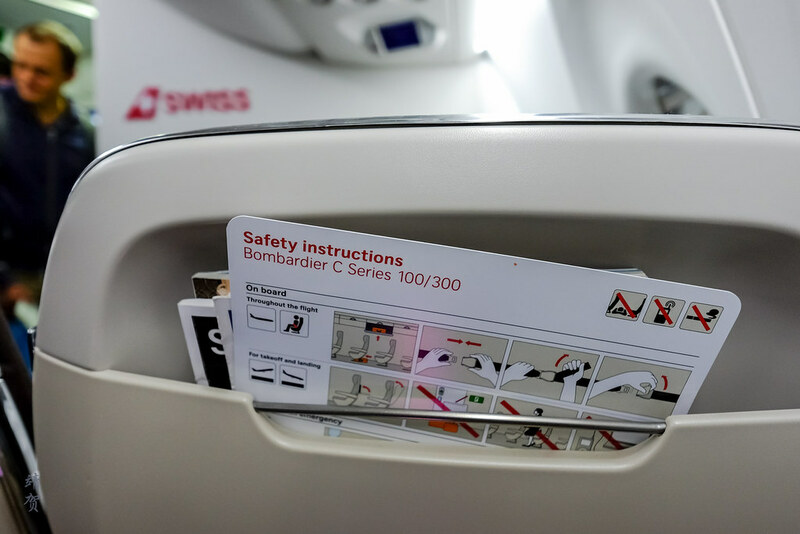 Yes, they are even better than the A320 Neos and the 737 Max, which is a huge thumbs up to Swiss for ordering these jets early. I certainly would be more tempted to fly with them within Europe. As to whether I managed to make my connection, do await my next post!